May 07 : Moral education should remain pivotal while grooming the youngsters admitted in higher and technical educational institution be it skill development or ICT based knowledge imparting, training and job induction, said Sh. 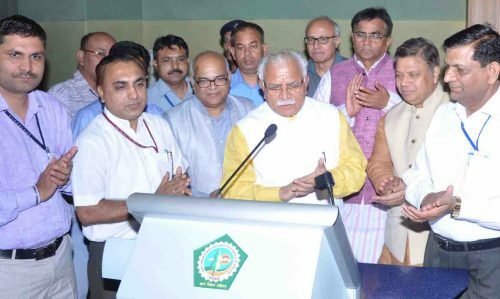 Manohar Lal, Chief Minister of Haryana while addressing a gathering of teachers and officers of the University at Guru Jambheshwar University of Science & Technology, Hisar. He said that the students be taught to remain ethical, committed and honest in their inbuilt behaviour so as to ensure their better contribution for the society in general and is specialized area in particular. He further urged that the main emphasis need to be given to ensure how to nurture and train a good human being especially in University level education. The Chief Minister inaugurated Boys Hostel No.4 (Vivekanand Bhawan) and laid foundation stone of Type-C and Type-D houses for the teachers and employees of the University. Sh. O.P. Dhankar, Agriculture Minister and Dr. Kamal Gupta, Chief Parliamentary Secretary and MLA Hisar were present on the occasion. Prof. Tankeshwar Kumar, Vice-Chancellor of the University presided over the function. Guru Jambheshwar University of Science & Technology Alumni Association website was also inaugurated by the Chief Minister. Sh. O.P. Dhankar, Agriculture Minister asked the scientific community to come forward and accept the challenges that the State faces today. He emphasized that the scientists, through their research need to answer the proper management of wastes be it water or vegetable or fruits or foodgrain and what not so as to ensure the optimum utilization of these natural and valuable resources for catering the diversified needs and necessities of State of Haryana. Dr. Kamal Gupta, Chief Parliamentary Secretary and MLA Hisar praized the contribution and recognition that Guru Jambheshwar University of Science & Technology, Hisar has earned the State of Haryana in particular and the whole of country in its latest NIRF ranking 2016. He assured full cooperation from the State Government for taking this University at International Level or which peace pretty confident. Prof. Tankeshwar Kumar, Vice-Chancellor while welcoming the Chief Minister and other dignitaries placed on record the academic reputation and national standing hard earned by this University in less than 20 years of its establishment. He said this University is not only ‘A’ grade University by NAAC since 2002 but has also been ranked No.1 University amongst the Technical Universities of India. The University is deeply associated with its social outreach programmes and it has adopted five villages of Hisar district where the University has conducted numerous activities directly useful to the residents and their wards. The University is very sensitive to gender issue being a burning topic in modern time and accordingly has made the provision to have one supernumerary seat earmarked for single girl child in its all UGC approved programmes. The University is also committed to skill development, digital file processing and Swachh Bharat Swasth Bharat abhiyan besides imparting technical education in more than 45 academic programmes through 18 teaching departments. Dr. Anil Kumar Pundir presented vote of thanks. Prof. B.K. Punia, Vice-Chancellor, MDU Rohtak, Dr. R.S. Sharma, Vice-Chancellor, CDLU Sirsa and Prof. R.K. Dahiya and Vice-Chancellor, DCRUST, Murthal were also present on the occasion.